Inexpensive Wedding Reception Ideas - Let Me Save YOU Money! You don’t have to spend a fortune to have the beautiful wedding reception of your dreams. It’s all about your guests coming to your celebration to share in your happiness and be a part of your special day. If you or your parents have a lot of money to spend on your special day, that’s great, however, if you are like most couples just starting out, read on and together we will plan your perfect reception. Let’s begin with the location of your venue. You can have your bash in your parent’s or a friend’s backyard, a community room, a Fire Hall or VFW Hall. The advantage of a backyard reception is that there is no cost to rent the space and you can make your own food or hire a caterer. I always recommend renting an outdoor tent or canopy to shelter your guests from the possibility of rain or other elements. 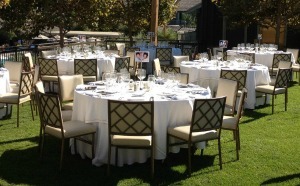 You will also incur some costs to provide tables, seating, dinnerware, tablecloths and etc. Have your decorations reflect your personality and style. Tulle can be purchased inexpensively at any fabric store and used to decorate an arch, chairs or wrap around pillars. Placing silk flowers purchased at a dollar store will add style and grace at very small cost. You can limit the number of guests that you invite to your celebration, just be certain that if you're inviting one set of family members or friends not to leave someone out by mistake. 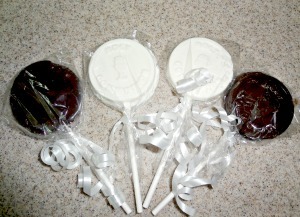 Chocolate flavored lollipops can be made quite easily. Purchase the form, some cellophane and ribbon. A few days before your wedding have a friend or family member help you make your inexpensive wedding favor. If your concerned about your time constraints just prior to your marriage, you can purchase wine/bottle stoppers and wrap them months before your nuptials. If you're creative, make your own favors and ask your bridesmaids and family members to help you with ideas and assembly. 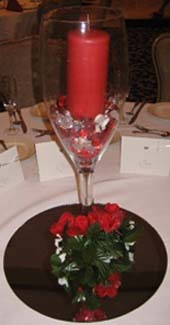 Clustering candles and placing live petals around the base of the candles can make an inexpensive, yet elegant table arrangement. You can ask friends and relatives to make their favorite dish for your party. Make copies of the recipes and place them on the tables for the guests to take home. Consider hiring a college student to be the DJ at your celebration or make your own mix of CD’s and play them on your own portable CD player. Speakers can be rented for the day at a minimal price. Another inexpensive music tip is to download your favorite tunes unto your ipod and play them from a docking station. Using my inexpensive wedding reception ideas can help you create a romantic, stylish wedding that won't blow your budget. Let's go to our Welcome page to look at ideas for planning your memorable wedding.